This past week was Earth Day, a time when everyone should do their best to not be irresponsible jerks to the environment we all share when, in fact, they should be doing every day. One animal that has become a sort of poster child for earth day and all things "green" and environmentally friendly is the frog. Frogs, and other amphibians are more sensitive to their environments than most other animals because of their permeable skin, which they normally use to drink and breath through. Because of this, when the air and/or water in an ecosystem becomes polluted, amphibians are usually the first ones to suffer. Ecologists work closely with amphibians and use them as a sort of marker if they are present in a habitat. If they are not (and there used to be or should be) we know something is wrong. An animal, like an amphibian, whose presence indicates a healthy environment, is called a bioindicator. So what does this all have to do with Prehistoric Animal of the Week? You should know by now that if there is a holiday of any kind, I try to make the weekly creature relevant in any way that I can. Halloween, Easter, Cinco de Mayo, Mother's Day, World Tapir Day...anything is do-able for me. (yes, there is a World Tapir Day and it is totally sweet) What better way to help celebrate Earth Day than by looking at the great granddaddy of all frogs? Check out Triadobatrachus massinoti! Triadobatrachus massinoti by Christopher DiPiazza. Triadobatrachus was the first known frog. It lived 250 million years ago during the Early Triassic in what is now Madagascar. It measured only about four inches long from snout to tail. 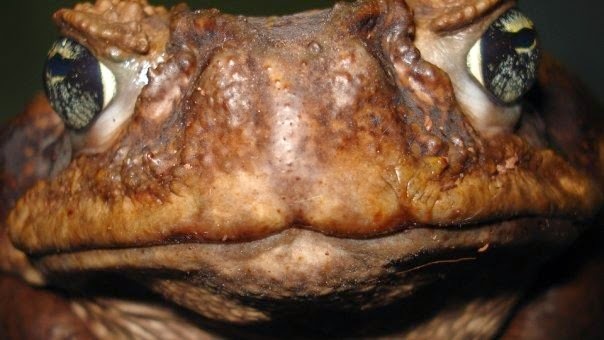 Going off of what we know about modern amphibians, it would be safe to assume that Triadobatrachus was a predator, swallowing any other creature small enough to fit in its mouth. The genus name, Triadobatrachus, translates to "Triple Frog". Triadobatrachus is an important fossil because it represents the oldest known member of the order, anura, which includes modern frogs and toads. 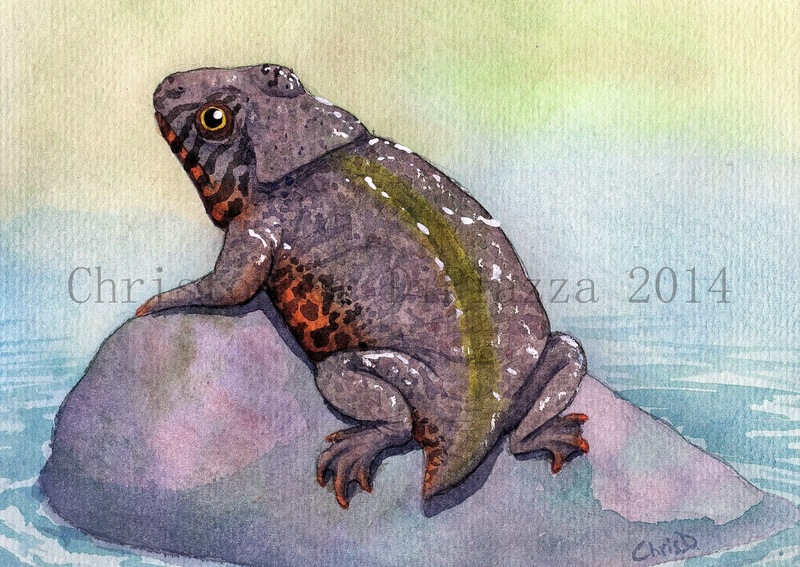 Like its modern relatives, Triadobatrachus would have been able to walk on land but was also at home in the water and would have gone there to breed. It possessed a wide skull and had no ribcage. A ribcage enables an animal that breathes with lungs structure and support to the chest as it expands and contracts. Amphibians absorb oxygen through their skin so they don't need ribs. Triadobatrachus' overall body shape was also very similar to modern frogs. 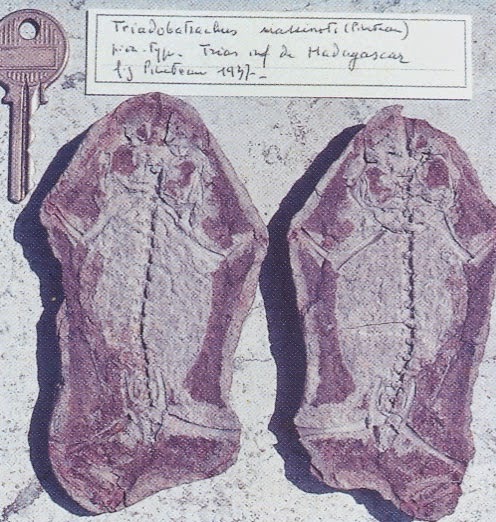 Triadobatrachus fossil at the Museum National d'Histoire Naturelle in France. The fossil is split between two halves of a rock that hardened from mud the animal was buried in, which leaves scientists with a beautifully preserved specimen! Triadobatrachus had basal characteristics differ from those of its modern relatives as well. Its hind legs were short, so it wouldn't have been much of a hopper. It also had more vertebrae than modern frogs, a short tail, and its radius and ulna (lower arm bones) were not fuzed together. Close up I took of my colleague, "Igor", a Giant Marine Toad. Toads and frogs are likely the modern descendants of Triadobatrachus. That's all for this week! Happy Earth Day and remember, always be kind to your planet. Triadobatrachus may be extinct but it would be a real shame if its descendants that we share our world with went extinct as well because of us! As always comment below or on our facebook page. Rage, J-C; Roček, Z. (1989). "Redescription of Triadobatrachus massinoti (Piveteau, 1936) an anuran amphibian from the Early Triassic". Palaeontographica Abteilung A, Palaeozoologie-Stratigraphie 206: 1–16. Steyer, Sebastien. Earth before the Dinosaurs. Bloomington: Indiana UP, 2012. N. pag. Print.